Priscillas: Garden , Garden, Garden.. 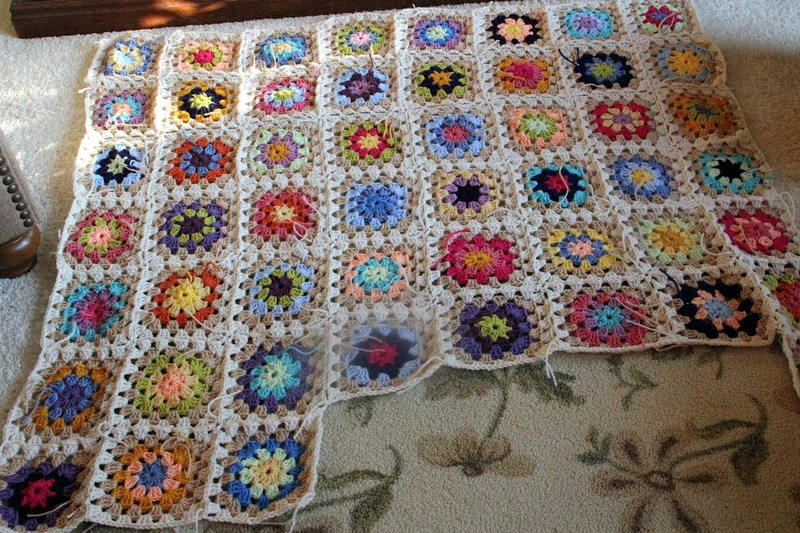 The progress so far on my Attic 24 summer garden square blanket..I have never" joined as you go " until this blanket.. I do like the way it looks! 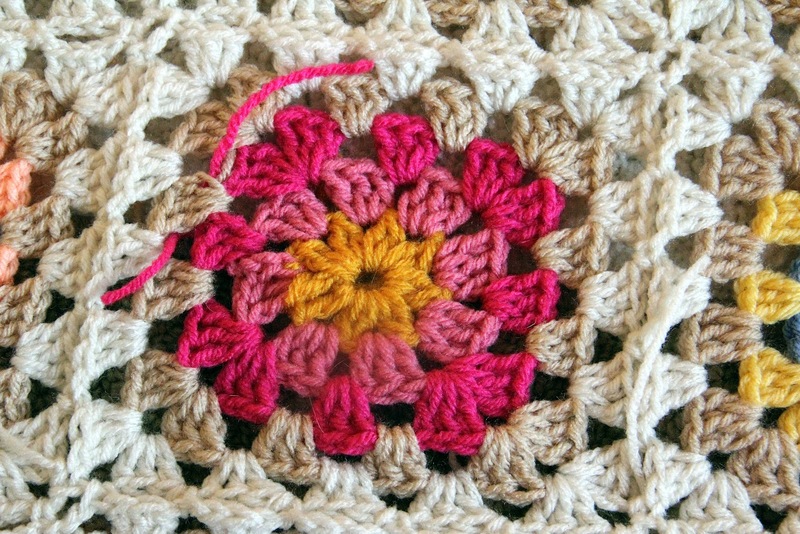 ..
After 3 rounds of color , I add the light tan round and then am crocheting together with off white. 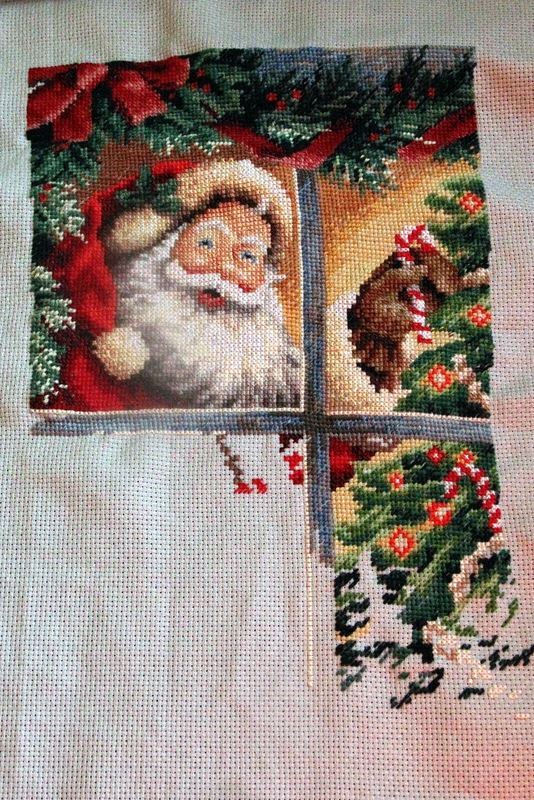 I have made a little more progress on the stocking.. the part I am doing now is the tree and so many color changes.. kind of hard to concentrate on it ! 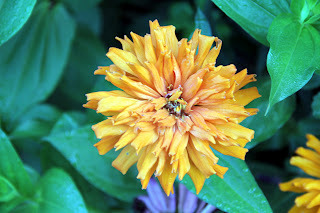 Some of my zinnias are blooming... all these were planted from seed..
We are getting alot of tomatoes.. so far 22 pounds. I have been roasting them and putting the sauce in the freezer. Love these little yellow finches that come and land on the sunflowers outside my kitchen window.. The coneflowers are putting on a pretty good show.. they must love the heat ! This little munchkin is 4 months now.. Could he get any cuter !!! Thanks for visiting my blog , I appreciate all your visits and comments !! I have fallen in love with Instagram .. come follow me @priscillablain..Have a great weekend ! I love the grannies! Great colors. 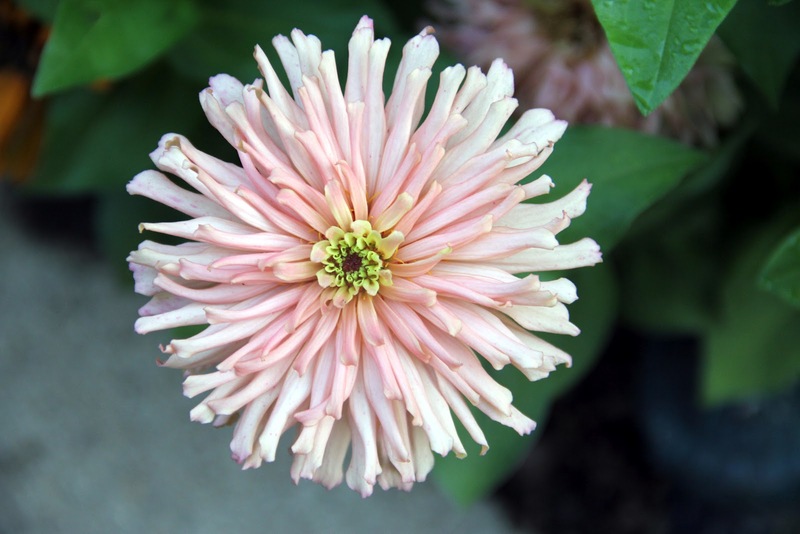 The choice of color and how and where it's used is just SO important and can make or break the perfect project! I love that tan and white beside one another! Your four month cutie is JUST that! Don't you just eat him up? And, uhm....where did the four months go so darned quickly? Geez o peet! 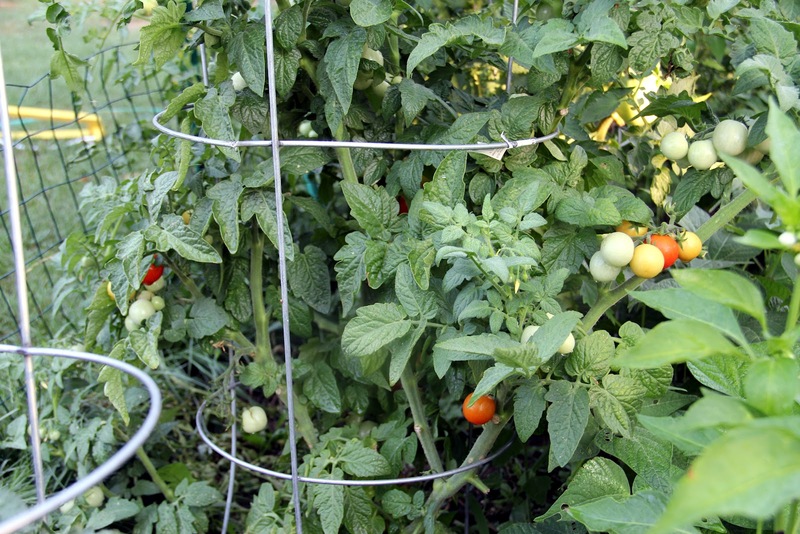 Your garden looks bountiful...and beautiful. I love the blanket!!! 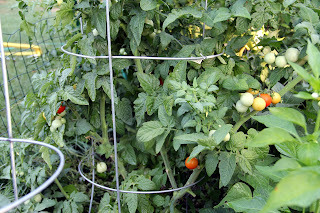 I am going to roast my next batch of tomatoes from the garden. I am a recent instagrammer too!!! Fun, but I am still learning!!! 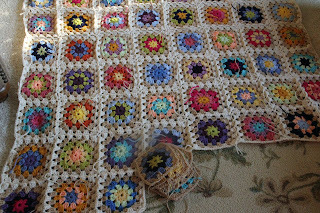 Absolutely love the wonderful mix of colors in that granny! I'm on a little crochet hiatus right now but when I'm in full crochet mode, I make lapghans for a couple of rehab facilities in our area and I have a couple of easy patterns I use. I think I'll add this to the mix! 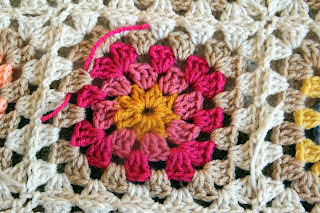 Your granny blanket is so cute and I love the colours you have choosen!I can feel the summer athmosphere.....wonderful work! Happy summertime from south germany! Hi Priscilla, love your throw. It is so vintage looking. I do not crochet. Wish I did sometimes, but when I tried it I did it way too tight. The Christmas stocking does look tedious. It will be precious when finished. Love your Zinnias. Mine have been gorgeous this year also. I think we need to have a veggie swap. 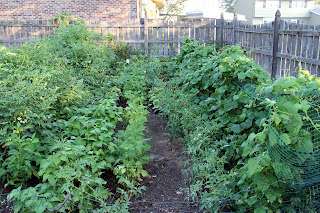 I have had lots of zuchinni and a few cucs but no ripe tomatoes yet. Getting close and I can't wait! Beautiful, all of it! I am envious of those cone flowers. We planted coneflower seeds in a pot 3 years ago and it keeps coming back. This year it has bloomed the most. Love it! 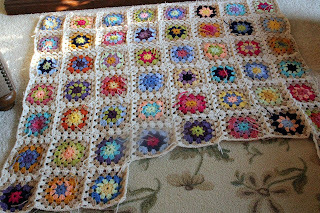 Lovely progress on your blanket, Priscilla... such bright and happy colors! And your garden is looking grand. Weird about no zucchini and cucumbers. While we were away at the beach last week, our zucchini went to town--you should see the size of one that my husband hauled out of the garden when we got home!! 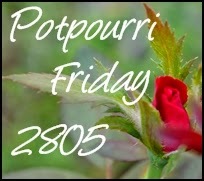 My goodness you have so much going on...love this post! And love that munchkin! what a cutie! The coneflowers and veggies look great. 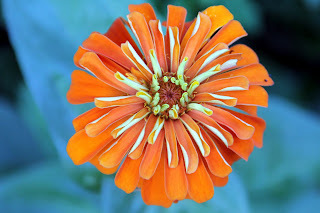 The zinnias are pretty too. Love coneflowers and zinnias. Your veggie garden looks quite successful! Enjoy your harvest! Hello Priscilla: The crocheted blanket is so bright and pretty. And I loved seeing the finch on the sunflower--what a lovely sight to see out your kitchen window! 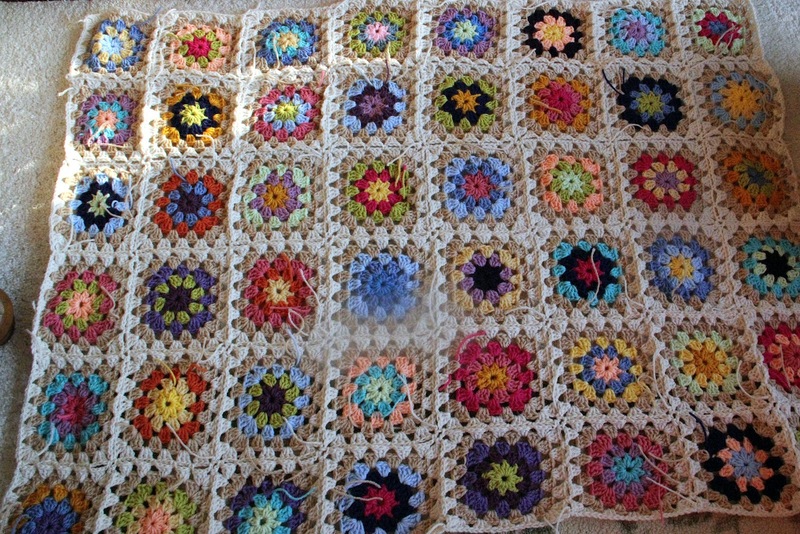 Priscilla - I've not crocheted in years and years - but your blanket inspires me - it is really charming. I like your garden very much - neat that it is bird-friendly too. That's it! 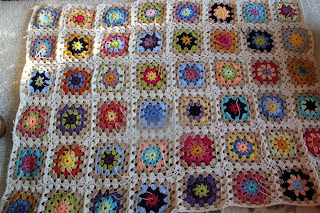 I need to start a granny square blanket, yours is gorgeous! Looks awesome! I haven't tried "join-as-you" go yet, but looks like you're being very successful with it! So much cuteness! 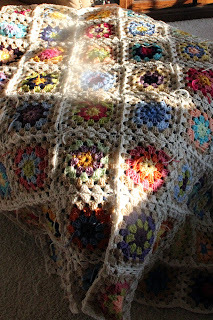 Love the granny blanket, the colours are perfect! The crochet blanket is coming along very nicely. Pass some sunshine over to our part of Scotland! Baby is a little cutie, wish mine were that size again! Thanks for stopping by. Love your granny ghan, the grannies are my new favorites. Can't seem to get enough of them. You Christmas stocking is just beautiful. 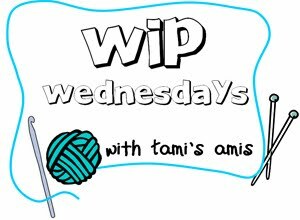 I'll be starting a very small autumn piece in a stitch along I'm participating in. Your little one is a most handsome little man. 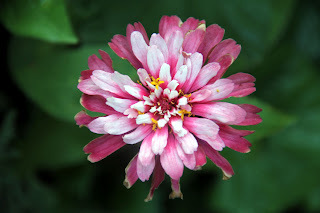 Enjoying your blog, I'll be back! Have a wonderful day. Very pretty! Love the colours. I am impressed that you are joining as you go. So I guess the colour placement this way is random? or is it planned? Lovely.